Snake bit: Figuring out (the hard way) which Bible texts apply specifically to you – and which do not. Jamie Coots, one of the stars of National Geographic‘s reality show Snake Salvation, died Saturday of a venomous snake bite. According to reports he refused medical attention after being bitten in his Full Gospel Tabernacle in Jesus Name in Middlesboro, Kentucky and died shortly thereafter in his home. 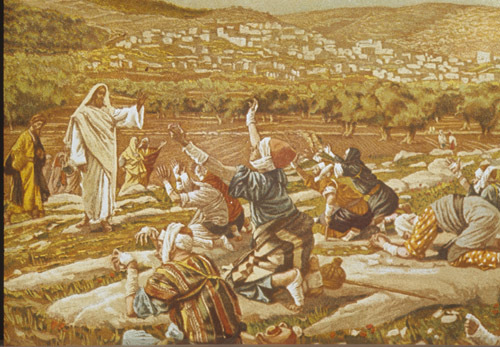 At length he (Jesus) appeared to the eleven as they were at table: and he upbraided them with their incredulity and hardness of heart, because they did not believe them who had seen him after he was risen again. And he said to them: Go ye into the whole world and preach the gospel to every creature. He that believeth and is baptized shall be saved: but he that believeth not shall he condemned. And these signs shall follow them that believe: In my name they shall cast out devils. They shall speak with new tongues. They shall take up serpents: and if they shall drink any deadly thing, it shall not hurt them. They shall lay their hand upon the sick: and they shall recover. And when Paul had gathered together a bundle of sticks and had laid them on the fire, a viper, coming out of the heat, fastened on his hand. And when the barbarians saw the beast hanging on his hand, they said one to another: Undoubtedly this man is a murderer, who, though he hath escaped the sea, yet vengeance doth not suffer him to live. There is a horrific accident. Some people die. Some are spared. Is it just a random game of numbers, or is there more to this than meets the eye? 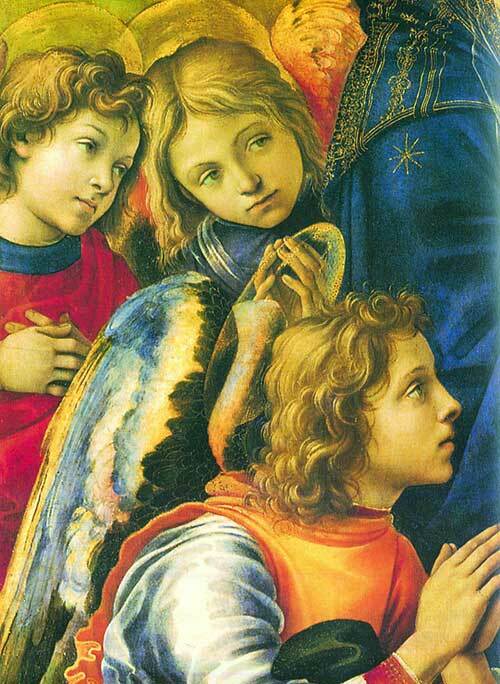 Catholics and even some non-Catholic Christians will tell you about their guardian angels – powerful, pure spirit beings, personally assigned by God almighty, to keep us safe from harm. Even less understood and appreciated are the “Kinsman Redeemers” who step forward to right wrongs and save their people from poverty, starvation, death – and worse. (10) And have taken to wife Ruth, the Moabitess, the wife of Mahalon, to raise up the name of the deceased in his inheritance lest his name be cut off, from among his family and his brethren and his people. You, I say, are witnesses of this thing. (12) And that the house may be, as the house of Phares, whom Thamar bore unto Juda, of the seed which the Lord shall give thee of this young woman. (13) Boaz therefore took Ruth, and married her: and went in unto her, and the Lord gave her to conceive, and to bear a son. (14) And the women said to Noemi: Blessed be the Lord, who hath not suffered thy family to want a successor: that his name should be preserved in Israel. (15) And thou shouldst have one to comfort thy soul, and cherish thy old age. For he is born of thy daughter in law: who loveth thee: and is much better to thee, than if thou hadst seven sons. (16) And Noemi taking the child, laid it in her bosom, and she carried it, and was a nurse unto it. (17) And the women, her neighbours, congratulating with her, and saying, There is a son born to Noemi, called his name Obed: he is the father of Isai, the father of David. (22) Obed begot Isai (Jessie), Isai (Jessie) begot David. Nor are Kinsman Redeemers required to be presently alive, here on earth. Catholics will explain the concept of the Communion of Saints – that great cloud of faithful witnesses who have gone before us – now in Heaven – eternally perfected in God’s power, grace and mercy. These holy souls have the right to approach the throne of the Most High God with their petitions – hopefully, interceding with him for us – their beloved progeny and “kin”. This goes much, much further and it is much more powerful than we might imagine – since by virtue of our baptism, we are all adopted children of God – brothers and sisters in Jesus Christ, the Lord – with his mother – the Blessed Virgin Mary, also ours. (28) And we know that to them that love God all things work together unto good: to such as, according to his purpose, are called to be saints. (29) For whom he foreknew, he also predestined to be made conformable to the image of his Son: that he might be the Firstborn amongst many brethren. (30) And whom he predestined, them he also called. And whom he called, them he also justified. And whom he justified, them he also glorified. (31) What shall we then say to these things? If God be for us, who is against us? (32) He that spared not even his own Son, but delivered him up for us all, how hath he not also, with him, given us all things? (34) Who is he that shall condemn? Christ Jesus that died: yea that is risen also again, who is at the right hand of God, who also maketh intercession for us. (35) Who then shall separate us from the love of Christ? Shall tribulation? Or distress? Or famine? Or nakedness? Or danger? Or persecution? Or the sword? (37) But in all these things we overcome, because of him that hath loved us. (39) Nor height, nor depth, nor any other creature, shall be able to separate us from the love of God which is in Christ Jesus our Lord. Remember too … All Souls Day and All Saints Day are rapidly approaching! We traveled to northwestern Louisiana this past weekend to attend a family reunion. 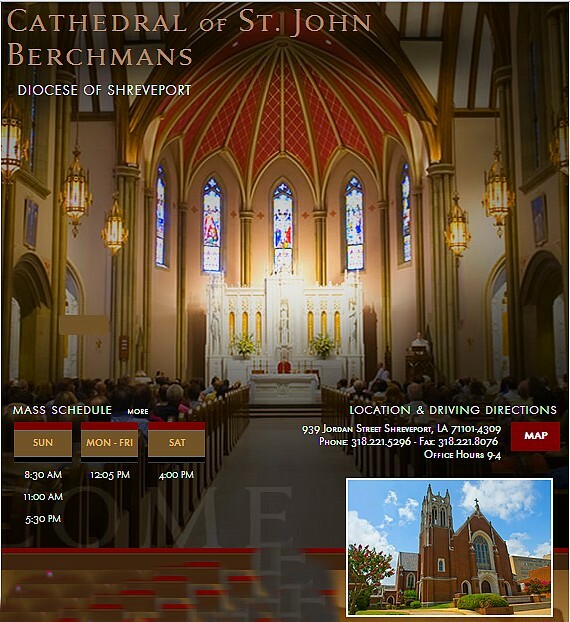 On arrival, it became abundantly clear that the people living in and around the Shreveport area tend to be very religious – but mostly – NOT Catholic. A Cathedral is considered to be the principal church of a diocese and it is also typically, the “seat” (cathedra) of the local Bishop. Non-Catholic Christian churches could be observed on almost every block, while Catholic churches were comparatively rare. But while the Catholic “profile” in the area appeared to be definitively low, the quality of the Catholic faith experience there turned out be pleasantly high – at least, at Saint John Berchmans Cathedral Parish! The church was traditional and beautiful – as were most all cathedrals of similar – 1920’s “vintage”. We were suitably impressed by the vaulted ceilings; the detailed wood and plaster work; the abundant and exquisite stained-glass windows; the deep-breathing, antique pipe organ;, the marble columns and the genuine stone (not wood) altar; along with the traditional statuary – which was both elegant and easily recognizable. We observed altar boys/servers (not altar girls) – and the servers were NOT wearing the usual dreaded, gaudy, overly casual – popular but seriously out of place athletic shoes. Coincidentally, this parish also produces more than the average number of new, priestly vocations. The congregation appeared to be well rounded and diverse, spanning the ages from eight months to around eighty years – with a number of young families in attendance. The standard Novus Ordo liturgy was celebrated reverently and totally “by the book” – with no shenanigans. A small group of RCIA catechumens occupied reserved seating. They seemed very happy and privileged to be there, reverently filing out at the appropriate time. A Deacon proclaimed the Gospel and delivered a homily that was both technically excellent and distinctly on-point. might have suffered a relapse at some point in the future! 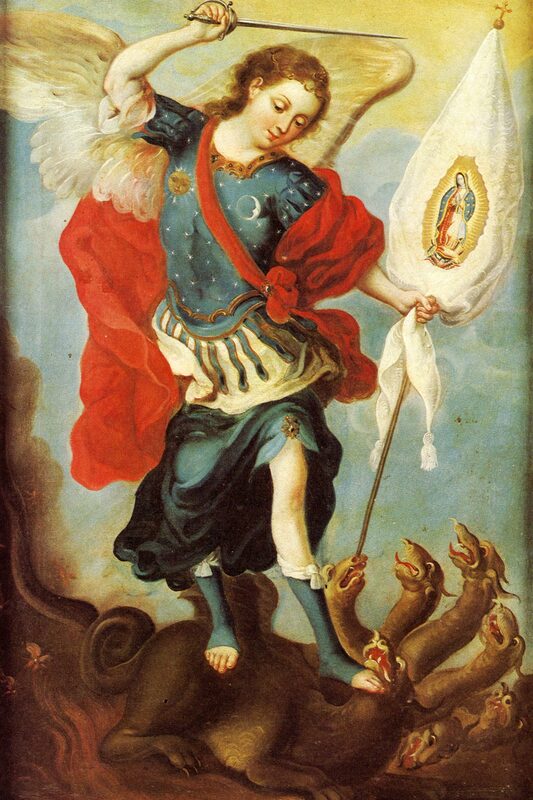 The Prayer to Saint Michael the Archangel was led by the priest and deacon, immediately following the official end of the liturgy. Compared to some very disappointing similar experiences in New York, Minnesota, California and Washington State, I would rate this as one of the best. A very pleasant surprise, in a part of the world where the Catholic Church remains seriously under-appreciated! The parish website will tell you much more, as will this Wikipedia post. I suggest you also take a few minutes to watch a very nice video presentation on the saint, the cathedral and the parish. So much negative Catholic stuff comes across my desk every day. T H A N K Y O U, J E S U S! At Oklahoma Wesleyan University we are filing suit against the Obama Administration, Health and Human Services, Kathleen Sebelius and the Affordable Care Act because we believe. 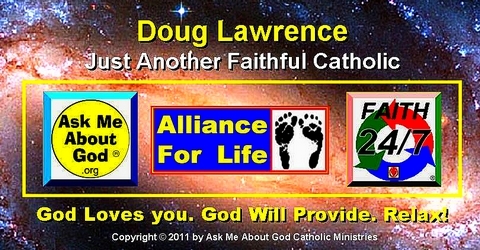 We believe whether you are Catholic or Jewish or whether you are Mormon, Methodist, Mennonite or Muslim that you should be free to follow your faith in matters of morality and contraception. We believe women should be free from any obligation to pay for a drug they find immoral and will never use. We believe that the racial genocide at the hands of a racist abortion industry must be stopped. We believe in personal privacy that no judge, legislator or President has any right to violate. We believe our nation’s girls and their sexuality should be treated with dignity rather than being degraded. We believe in a culture of life and not a culture of death.